Hortus Camdenensis | Rubus odoratus L.
Fully-hardy, fast-growing, thicket-forming, deciduous shrub with spineless shoots, ovate, 5-lobed leaves, to 24cm long, and panicles of shallowly cup-shaped, fragrant, purple-pink flowers, to 5cm across, in summer and autumn, followed by flattened, edible red fruit. To 2.5m. [RHSE, Hortus, Hilliers']. 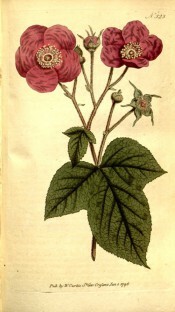 ‘Botanists and Gardeners have given to this species of Rubus the name of flowering, not because it is the only one which produces, but from its being regarded for its flowers merely; they indeed are so shewy, and so plentifully produced, that the plant has long been thought to merit a place in most shrubberies; to the inhabitants of which, both in the largeness and elegant form of its leaves, and the colour of its blossoms, it forms a pleasing contrast. It is extremely hardy, and easily propagated by suckers the only care which it requires, is to keep it within proper bounds: young plants of it produce the largest and finest flowers. It blossoms from June to September, is a native of different and distant parts of North-America, and was cultivated here by Mr. Miller, in 1739. Cornutus, who first figured and described this plant, gave it the name of odoratus, on account of the fragrance of its foliage; his words are " elegantissimi hujus folia fragrantissima sunt, paremque agrimonio odorato spirant odorem:” the fruit, rarely produced with us, he observes, is like the common Raspberry, but not so pleasant.’ [BM t.323/1796]. Listed in the 1845, 1850 and 1857 catalogues [T.912/1845]. More details about Rubus odoratus L.